I had so much fun at the Thrive Blog Conference this weekend! I hope you were able to follow along on the fun on Snapchat! All week I am going to be sharing different insider looks at my blog conference experience. This was my second time to attend Thrive and my third blog conference ever. I feel like I am kind of start to get the hang of these things. 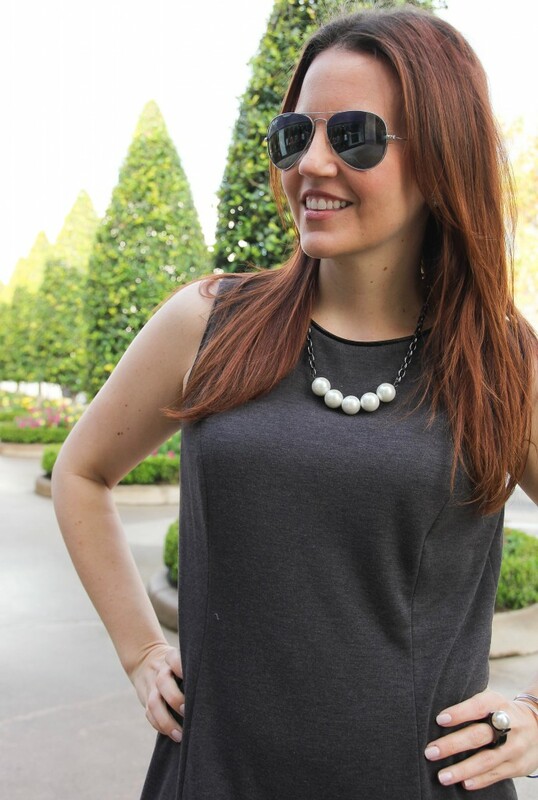 My first insider look is all about what to pack for a blog conference. This conference was only a day and a half and only an hour away, so I packed much lighter than I would for a longer conference or one where I am flying. While I am normally a notorious overpacker, I tend to pack semi-light for a blog conference. I plan all my outfits out well in advance all the way down to what jewelry I am going to wear. 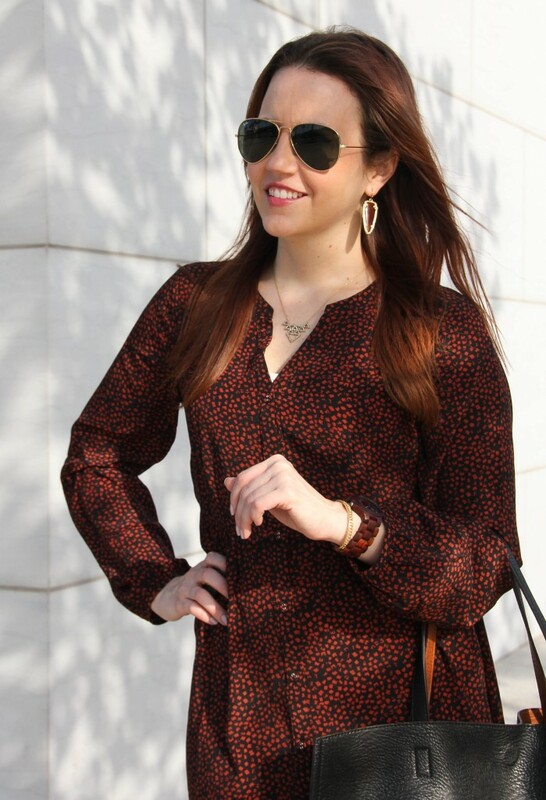 My blog is all about fashion, so I want my outfits to really represent my style well. I lay out all my planned outfits side by side by event. 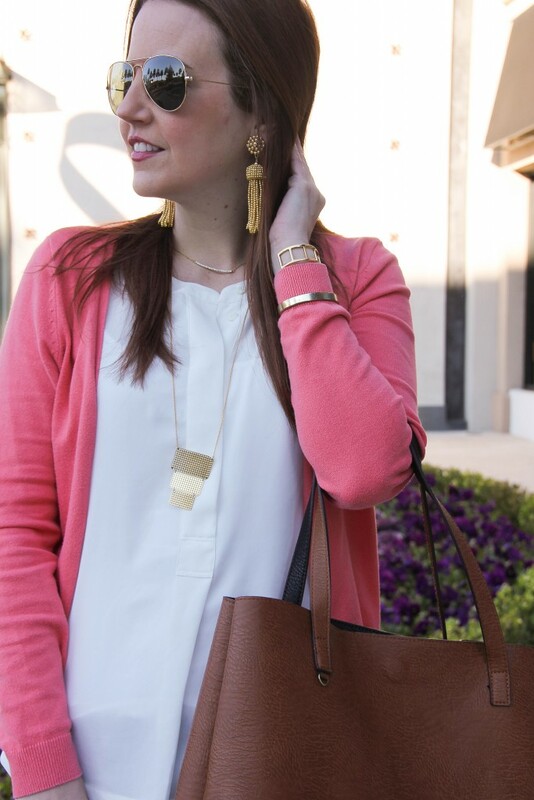 I try to coordinate my jewelry, so it can be worn mix and match with all my outfits. I then layout my handbags to see how they will look with the outfit. I like bringing crossbody bags for the night mixer events, because they help keep your hands free to shake hands, hold drinks, share pics on Snapchat 🙂 , etc. I also always bring a backup outfit that will work for all or most of the events just in case. I make sure it will work with the jewelry, purses, and shoes I already have packed. Speaking of shoes, I always bring several pairs of shoes with me too. For this conference, I ended up bringing all nuetral shoes without realizing it. 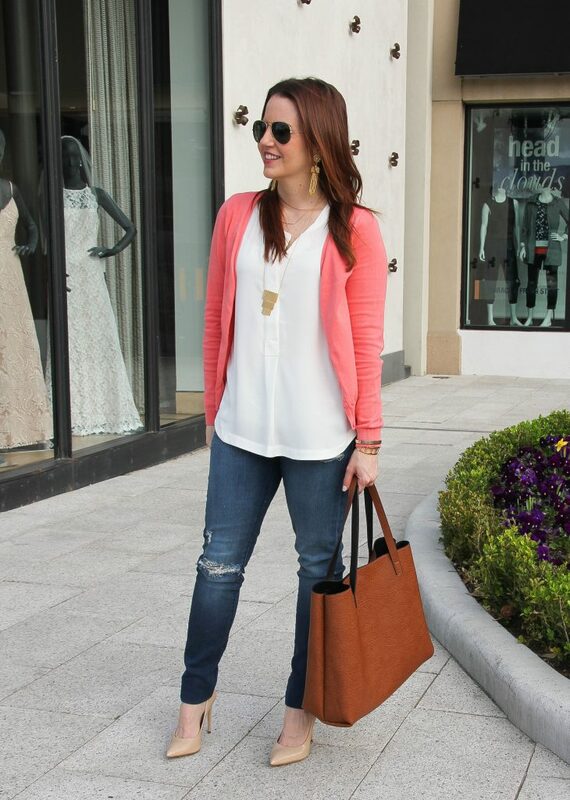 I always be sure to bring a comfy pair of flats or flat sandals for walking around the hotel or exploring the area. I also bring cute pajamas, because you never know who you may run into in the hall while filling up your ice bucket. I highly recommend bringing a jacket or cardigan, because some conferences can be a little cold. Below is a look at some of the items I packed for the Thrive Blog Conference. You can click on any picture to shop that item or hit the black arrows to scroll through to see all the items. Next on my packing list is my beauty products. 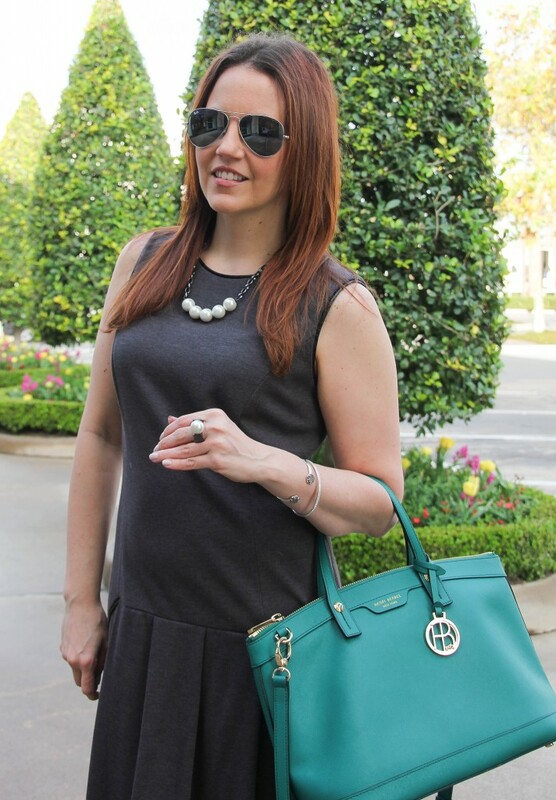 I love this Henri Bendel train case, and this color is back in stock! It also has a strap so it can be worn on your shoulder. I love the little side pockets for storing any brushes or pencils easily. 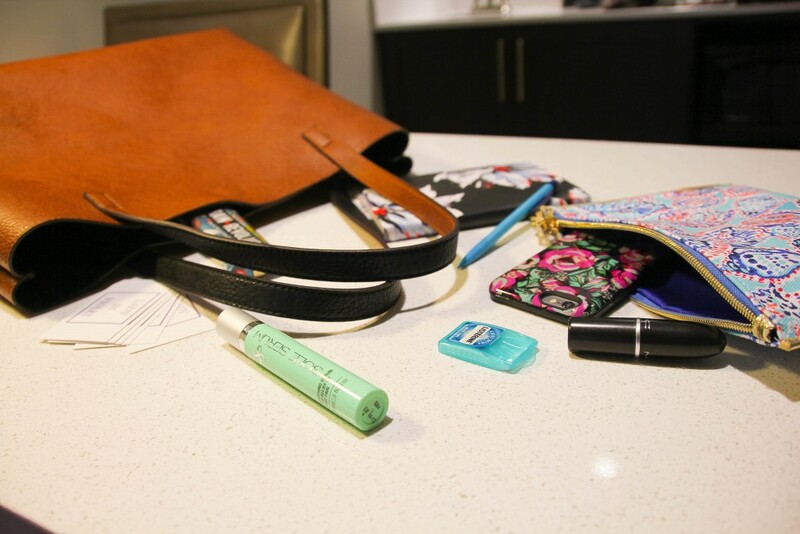 Most of what I pack is my everyday makeup and toiletry items. Some of my current fave brands are Bare Minerals foundation system and It Cosmetics eye makeup. A few extra items are the nail polish I am currently wearing in case mine chips, and the Urban Decay All Nighter Spray to help hold my makeup in place during an 8+ hour conference day. When it comes to the actual conference portion, I like to bring a tote or large purse filled with my necessities for the day. I always bring a notepad and pen or pencil. All the conference that I have attended have provided paper, but sometimes it may not be exactly what you want. They don’t always provide a pen, so you definitely want to bring one or two of those. I also bring my blog business cards to hand out to fellow bloggers and brands during the conference. For this conference, I carried my big tote bag, so I brought my Lilly Pulitzer pouch to put some of my smaller items in like my lipstick, phone, wallet, and room key. It makes it easy to find items then hunting through a huge tote. I also always bring a snack and usually a water bottle. I just found these Raw Revolution bars and love them!! Another favorite to bring along is Larabar or Kind Bars. I like to have a healthy and filling option on hand. 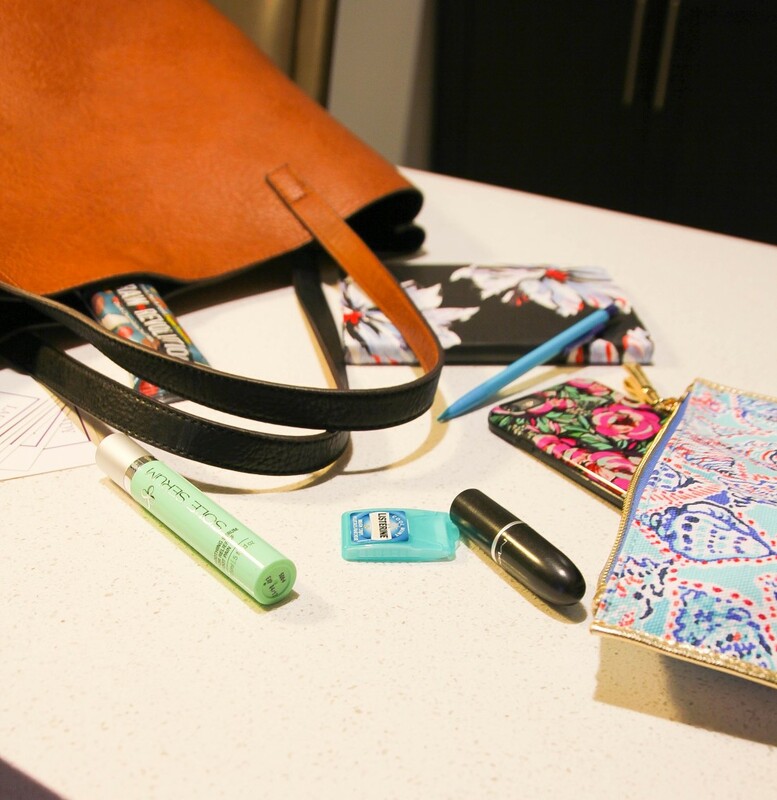 I toss in a couple beauty items like my Sole Serum in case my feet start to hurt, lipstick for touch-ups through out the day, and my Listerine pocket packs to keep fresh breath for networking times. I also bring my camera just in case I want to shoot any photos. Most conferences also have a photography session, so it’s nice to have your camera in case they give demonstrations. Sometimes the session leader will answer questions about your camera afterwards too. The camera shown below is the current model of what I own. The one I have has been discontinued by the brand. For my suitcase, I just brought my carry-on bag and filled my tote. I’m currently looking for some new luggage, so if you have any recommendations leave them in the comments below! 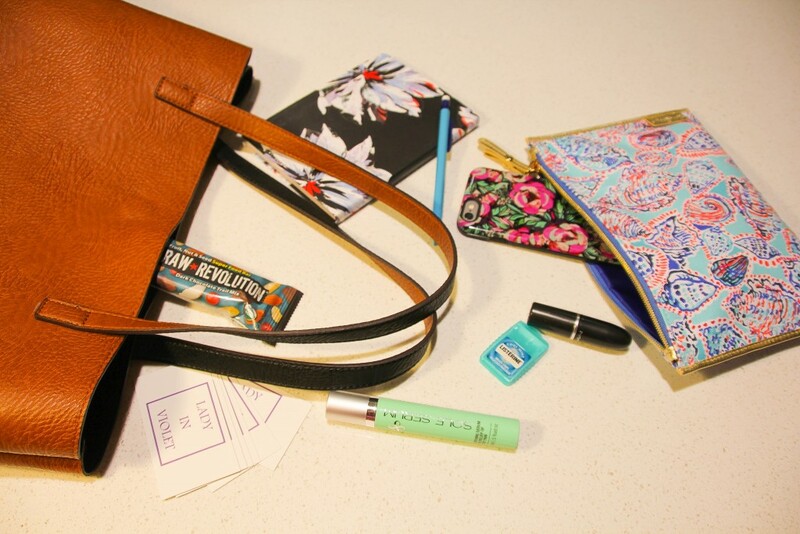 I hope you enjoyed this peek into what I packed for the blog conference. Stay tuned all week for more looks inside my Thrive Blog Conference weekend! I’m kind of obsessed with this dress right now! I love so many different things about it. For starters, I love that it is both black and brown. 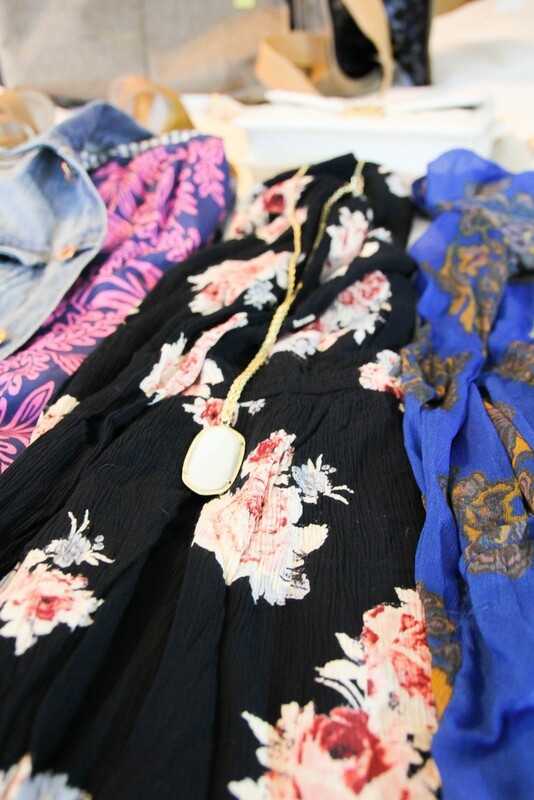 It makes it so easy to pair with different accessories. I can easily wear with both brown or black shoes or purse. 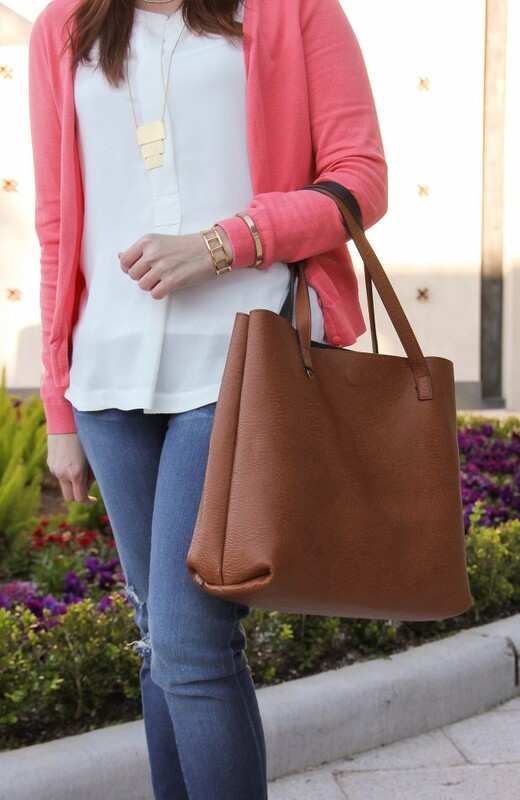 You could even toss a colorful purse with this to add even more color to the look. Second, I love the material. 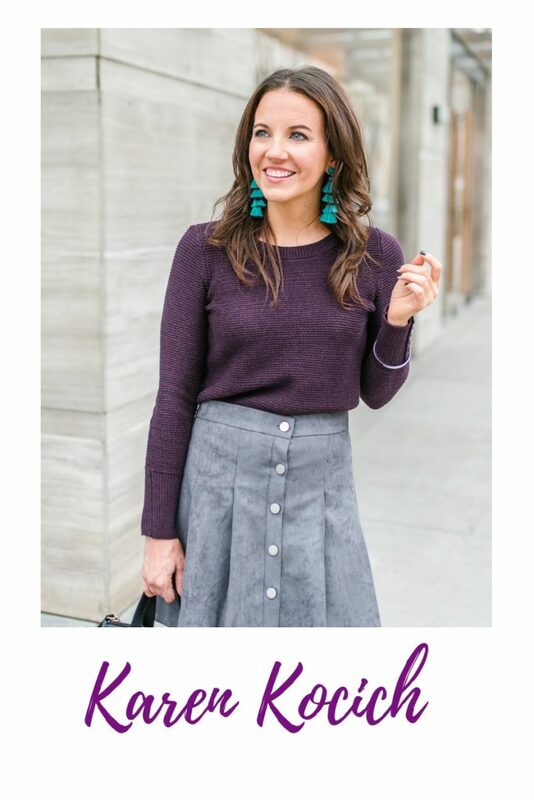 It is lightweight and perfect for fall, spring, and possibly even winter with some tights. Last, I love the style of this dress. 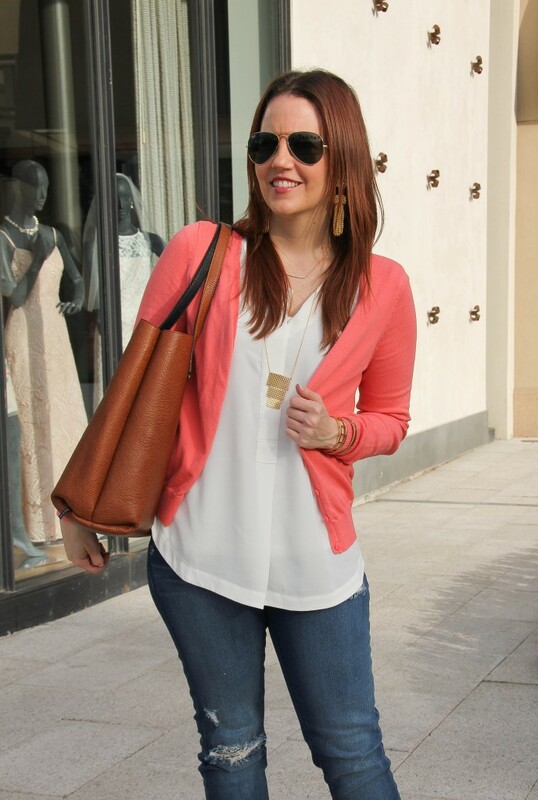 You can toss on some heels for the office or wedges or riding boots to make it more casual. 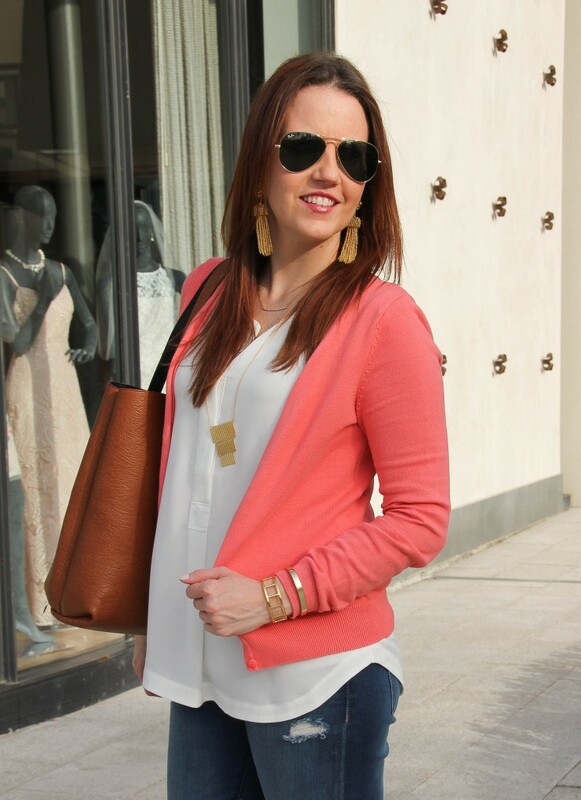 You can also add a long pendant necklace to this look too! I also like the long sleeves because I get cold super easy. Plus, once it warms up, everyone blasts the A/C inside. As soon as I saw it, I knew it was going to become a highly worn dress in my closet. 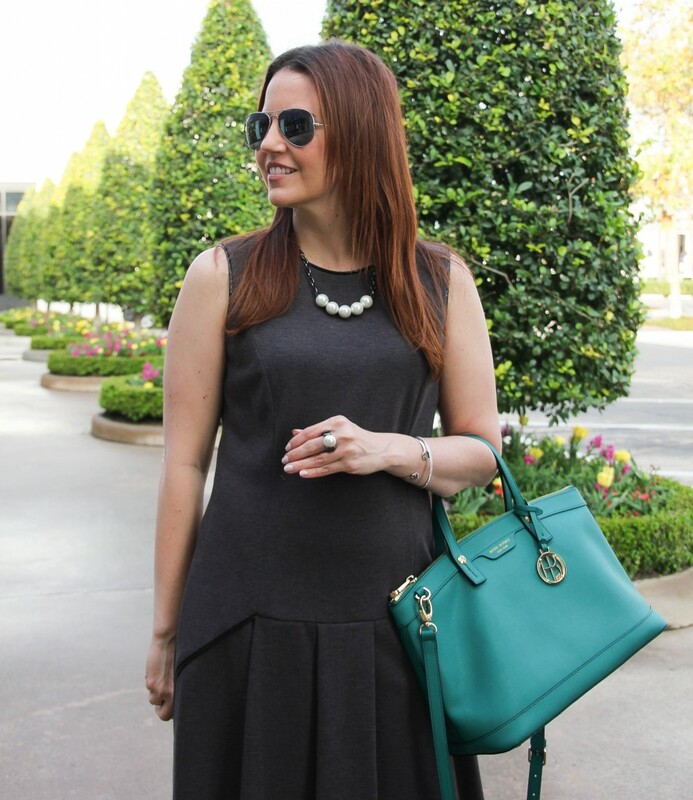 If you want to create a more defined waist line, you can add a belt to this dress. I really like the comfort and ease of the slightly loose fit. 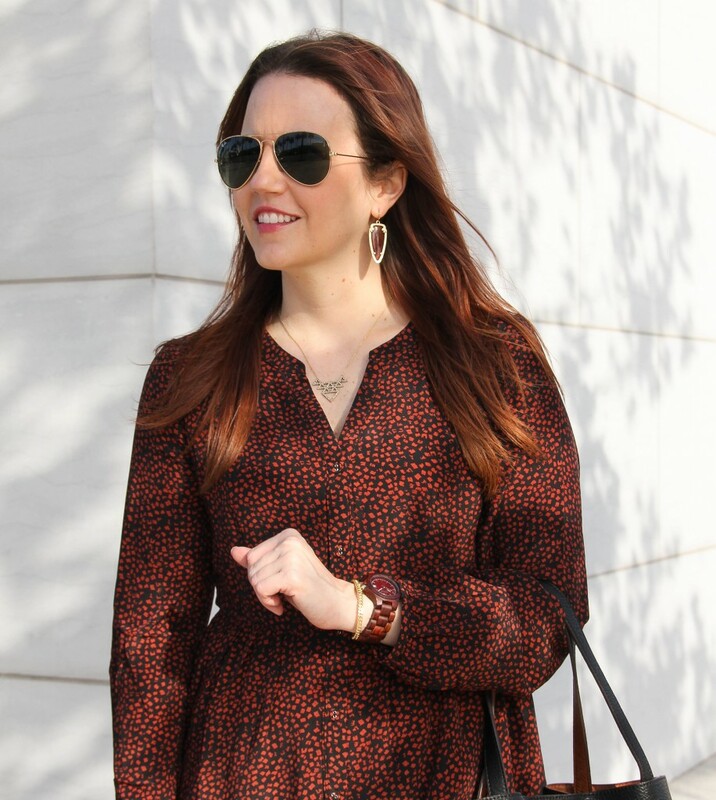 The darker colors of this dress definitely have a more fall look. 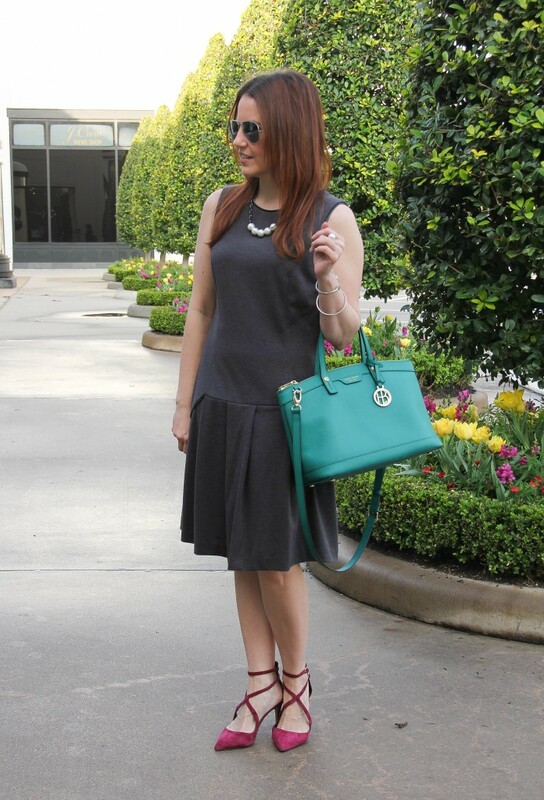 If you want to make some of your favorite fall dresses work for spring, try pairing them with wedges. 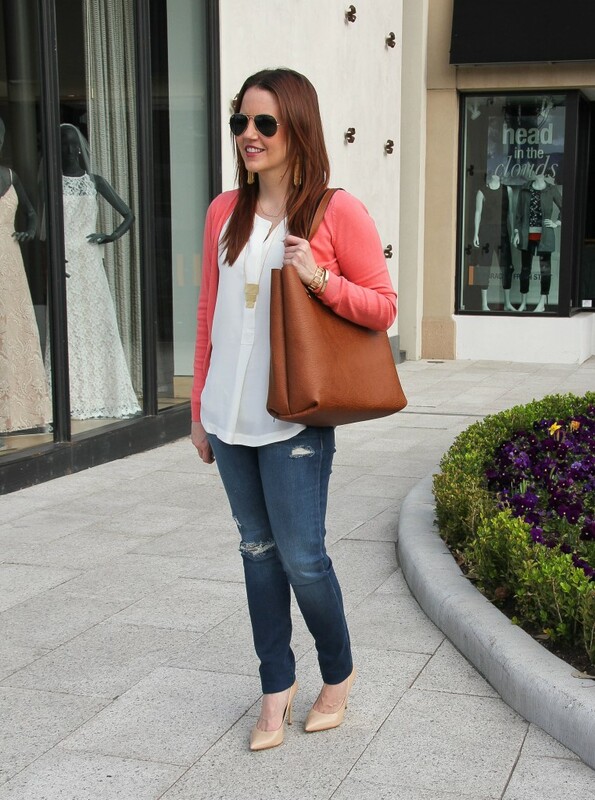 A change of the shoes is one of my favorite ways to transform an outfit between seasons and events. 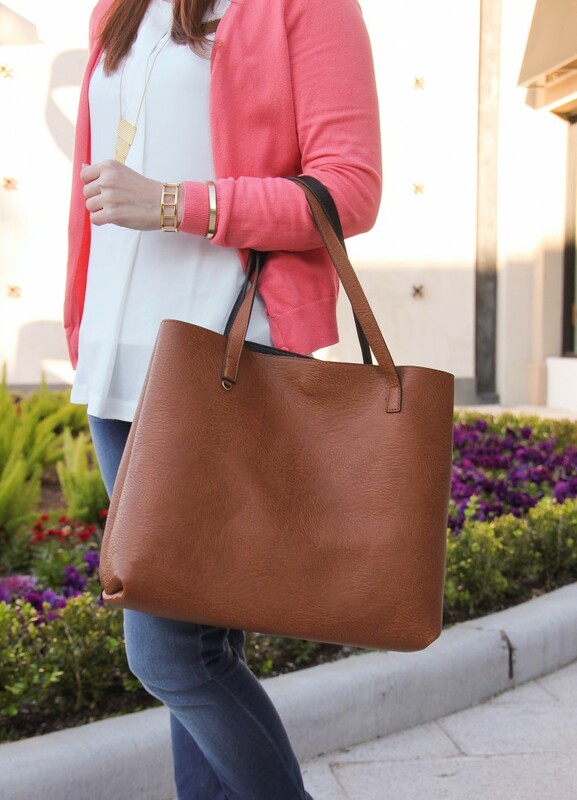 Also, this tote is my reversible tote that you have seen on the blog before but normally I have it on the brown side. I wanted to show you the other side. 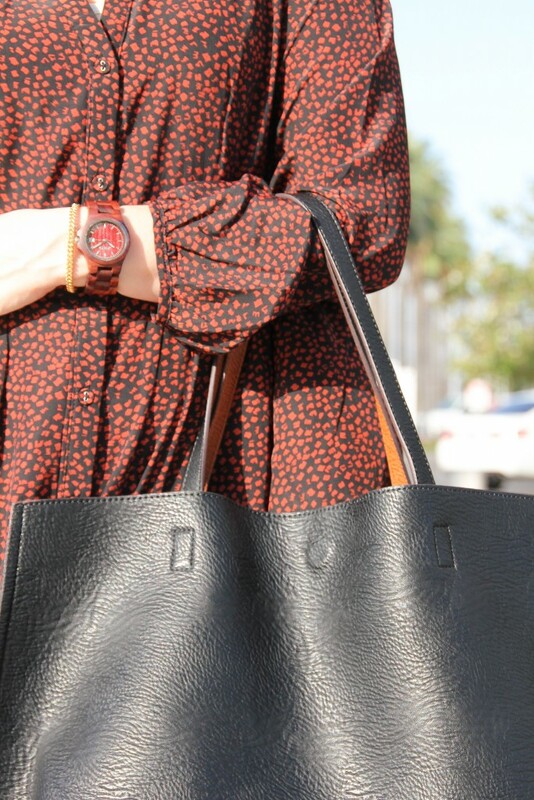 Much like this black/brown dress, the black/brown of this tote make it so versatile! It will definitely be coming on my summer trips, since it’s like packing two bags in one!